I’ve received quite a lot of interest for my photo, The 97 Switchbacks at Night. I’m pleased to finally announce that I will take orders for prints of this photo. For the past several months, I’ve been working like crazy at my day job. That project has finally come to an end, and as a result I finally have time to return to my photography, which is my #1 passion when I’m not working. That passion demands the utmost quality in my prints. I’ve therefore selected Fujiflex Crystal Archive prints for this photo. It’s just an amazing printing technology that reminds me of Cibachrome / Ilfochrome, which I used to print myself when I had access to a darkroom. A LightJet imager “prints” onto photographic paper with lasers and then the paper is developed through photochemical processes. It looks wonderful with this image, and you can see one of these prints in the Eastern Sierra Interagency Visitor Center as noted in the previous posting. Each print will be personally inspected and signed. In addition, I’m including mounting in the price. The image will be float mounted onto acrylic or aluminum with a border, ready for a matte and frame of your choice. Contact me directly if you wish to have it border-less or laminated and we can work out on a case by case basis. 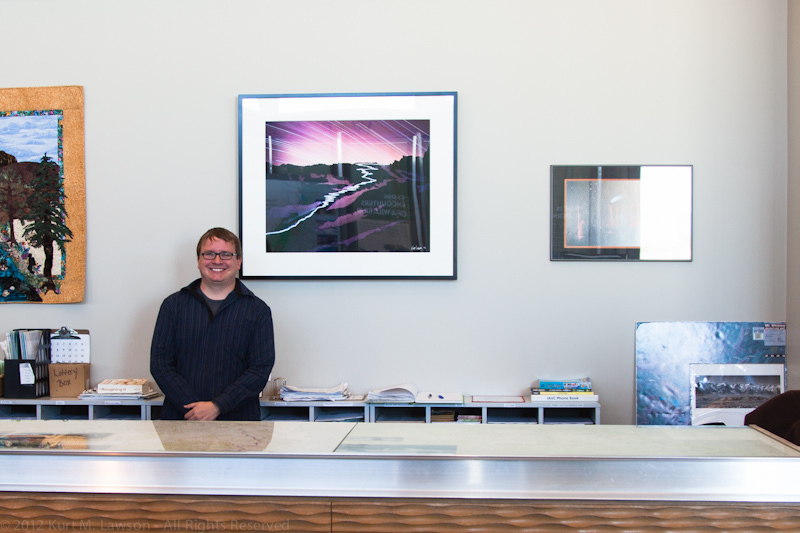 Fujiflex printing and the professional mounting are not cheap, but they are stunning prints. This is not the only way I am going to offer this image, however. I’m currently working with a few people to produce some posters and post cards with The 97 Switchbacks at Night on them, which I hope will be sold in the area as well as direct from me online. I’m waiting currently on some quotes before that can proceed. Naturally, the pricing on these reproduction posters and postcards will be what you might expect based on the price of other posters for sale. The total poster size will be 18×24 inches. Post cards will be 4×6. I’m also busy preparing a selection of prints for my first gallery exhibition. Details for that are coming soon. It will be in my home town of Fort Wayne, Indiana this fall and I will be there. For print ordering, Paypal seems to be the easiest thing for me at the moment, though I will work on more and perhaps better ways to accept payment. Please contact me at prints “@” kurtlawson.com and I will send you a Paypal invoice based on what you want, and then I can make prints and get them to you as soon as possible. On Saturday March 3rd, 2012 I loaned a print of The 97 Switchbacks At Night for display at the Eastern Sierra Interagency Visitor Center in Lone Pine, California. 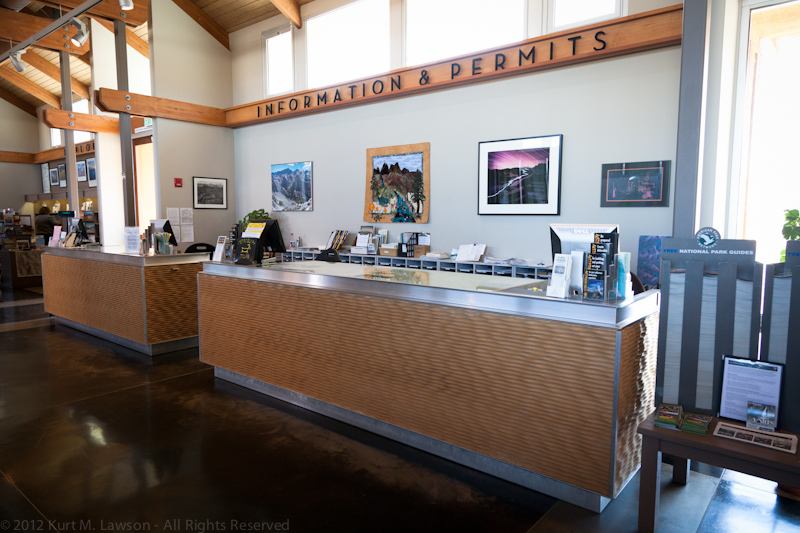 This is the very same visitor’s center where permits are picked up to climb Mount Whitney. The print measures 24×30 inches and is a FujiFlex Crystal Archive print, with about 4 inches of white matting and a quality black wooden frame. I’m really excited for people to be able to see it. I have twice visited this visitor center to pick up Mount Whitney permits myself, including the permits for this very photo and my own ascent to the summit in 2010. The next time you find yourself in the Owens Valley, stop by and check it out. The FujiFlex print is really something to see compared to the small version online. 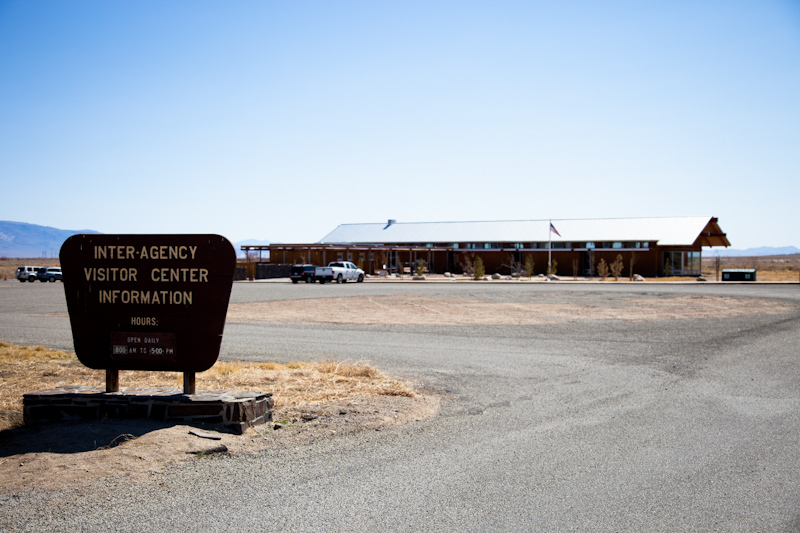 The Eastern Sierra InterAgency Visitor Center is located at the junction of US Highway 395 and State Route 136, one mile south of Lone Pine. fabian - Hey Kurt! I’ll be doing Palisades this weekend, I’ll check the picture out!!! Well today is the last day of 2011. Last year was a great one for my photography, and this one has turned out to be exceptional as well in my opinion. I learned a lot this year and I feel my shooting has matured at least a little. I still manage to shoot 800 frames a day (lots of exposure bracketing) in places like Death Valley. Indeed Death Valley was a frequent destination this year, as it proved a convenient place for me to do test exposures for my Mount Whitney project. Perhaps I was a bit biased after falling in love with that park in 2008 after my first visit, but its proximity to Mt. Whitney and absence of human or animal interference was a factor. I also got to visit a place I had been longing for: the Ancient Bristlecone Pine Forest in the White Mountains. I ended up making three visits to this magical place. This year also saw a return to Anacapa Island, as we made good on our plan to camp there overnight. I had planned to shoot star trails at Inspiration Point, but some insane winds all night forced me to use my tripods to stabilize my tent instead. I made quick visit of Yosemite through Tioga Pass, and finally did some shooting in the Alabama Hills. Virtually every single trip prior to August was designed around test shots for the Mount Whitney project. That project turned out to be a huge success, as the final image speaks for itself. I can only hope that 2012 will bring in new and exciting photo opportunities, and I’m looking forward to new adventures. Sorting through some 18,000 frames was not easy, but in the end here are my 11 favorites from 2011. And be sure to check out my 20 favorites from 2010 as well. When I posted this image to flickr, I just titled it “WOW.” I couldn’t think of anything else, and when I had walked away from the landscape I spoke out loud “thank you” for the experience of just being there for that. December 2009 saw heavy rains that created a temporary lake at Badwater, Death Valley’s lowest point in North America. There was no wind, so the lake offered a near perfect mirror to the spectacular light show in the clouds. I couldn’t move my feet as the water would ripple for 5 minutes. I was quite contorted as I shot this panorama without a ripple, and this is the result of those efforts. After shooting the panorama of the sunset, I went to bed early. I awoke at midnight and headed back to Badwater with one thing in mind: Star Trails. I was shooting my first test exposures for the Mt. Whitney Project, and placed a number of film cameras and opened their shutters. I then placed my 5D2 out in the water and set the timer for a 45 minute exposure. Due to long exposure noise reduction, I had a 45 minute wait after that was done before I would see an image. I decided I would go to Zabriskie Point maybe for my next digital star trails. When I got there the camera was done and I was floored by the image on the tiny LCD. I scrapped the Zabriskie Point idea and sped straight back to Badwater and shot this shot as my second exposure. I’m glad I did! The wind was basically nonexistent again, producing clear reflected star trails with just a bit of rippling at the end of the exposure. A final favorite from the mirrored reflections is this image from my second trip to Death Valley this year. The water was still, and this morning there were a few other photographers present at sunrise (at the far right of frame). Here the blue shadow of the Earth can be seen just before it is fully chased away by the rising sun. I just love the soft hues here and the mirror reflection. In March I paid a visit to the mountain that would really occupy my mind for 9 months out of the year. We had just passed into spring but it was very much still winter up on Mount Whitney as you can see . I like this one as it is very dynamic with the clouds and snow blowing across the valleys and passes leading up to the mountain’s 14,508 ft summit. I stood up on that highest point in August 2010 and that trip inspired my project. The stars! This image, shot in the Alabama Hills looking towards Mt. Whitney (just to the right of center), was one of the shots upon which the Mt. Whitney Project’s exposure was based. Long, beautiful star trails and the rising moon illuminating the tops of the Sierras. This was more the expected colors for the final shot, which would turn out to be colored quite differently. It should be no surprise that this image, the culmination of my Mt. Whitney Project is here on this list. All the effort of planning and hard work and the generous volunteer work of friends new and old helped me capture this. The infamous 97 switchbacks of the Mt. Whitney Trail, illuminated at night by lantern. My favorite shot from 2011, and pretty much the end of sleepless nights shooting star trails for this year as well. This year saw the visit of the Union Pacific Railroad’s beautiful steam locomotive 844 to southern California for the first time in many years. Being a lover of steam locomotives since I was a kid, I set out to capture this locomotive during it’s visit. This is by far my favorite capture from this trip. The previous night I headed into Afton Canyon in the Mojave Desert to scout out a location. I picked this exact spot and returned in the morning to capture 844 as she headed downhill through the canyon. She was a little late, but 844 put on a spectacular show of steam. I saw before 11-11-11 that there was a flickr pool set up for this day with lots of people planning to capture something from this numerically amusing date. I headed out with my gear down to Manhattan Beach, California armed with my new Lee Big Stopper 10-stop neutral density filter. This image was one of my first to use this filter, which allows you to shoot longer exposures in broad daylight. A storm was rolling in and I used it to produce this surreal effect, imagining that it might resemble my previous night exposures but during the daytime. During this shot the sun briefly poked through the clouds producing the sunburst. No longer focused on star trail tests, I paid a visit to Death Valley to enjoy its many wonderful places. A longtime favorite has been the Mesquite Dunes near Stovepipe Wells. On this afternoon, scattered clouds were breaking up the light, causing some dunes to be in bright light and others in shadow. As I was shooting and the light was fading, the sun descended behind a bank of dark clouds, masking the light and isolating a dune in the distance. I spotted this scene and pointed my 100-400mm zoom, using ever millimeter it offered. I love the isolation and contrast of the bright golden dune vs. the whacky shadowed dunes in the foreground. I honestly don’t know where the blue-green tones came from in the shadows but they were there in the raw file. I decided to go to Dante’s View for sunrise for once, even though there was a chance of rain. I was seeking out weather and drama in the skies, so I headed up there before dawn and was incredibly glad I did. Clouds in the East masked the rising sun, producing a sliver of light that traveled down the Panamint Range. In my initial pass through these images I had somehow overlooked this one, but now I can’t stop coming back to it. There’s something about it that just captivates me and makes me return to it again and again. I love the red tones and the contrasts of the salty flows on the valley floor. And finally, I offer up an enormous panorama of the sliver of light taken at one of the more dramatic points in the morning. It was a frantic morning trying to capture this scene, as the light changed by the second. If I am to print this 12″ tall, it will measure 125″ wide. It was really a sight to behold and I hope that this will offer you at least an impression through which you can experience a bit of that morning yourself. Well there you have it. Before I change my mind again, here are 11 favorites from 2011. Next year I hope to travel to some new places, both in Death Valley and the Sierras and new unexplored places. I hope 2012 allows me to produce images at least as interesting as these, and I hope that you have enjoyed viewing them as much as I have enjoyed capturing them and sharing them with you. I wish everyone a Happy New Year! Xingyuan Wang - Nice! I especially like “First moonlight” and dunes… those shots of the flooded desert are also eerily beautiful. Jim Goldstein - Fantastic set of images. 97 switchbacks and 1st light on mount whitney are top notch. Thanks for taking part in my blog project. admin - Thanks Xingyuan and Jim! Greg - would love to know when this becomes available as a print.